Chess is inherently a strategic game. That's why strategic skills are the most important thing in chess. They allow you to understand what you should do in any position. Chess players usually call it "a chess understanding". In fact it is not so difficult to study some opening lines or theoretical endgame positions. Players experience biggest problems in complex middlegame positions, when they are not sure what to do. Please, remember the strong chess players you know. How do they win against weaker players? They create complex strategic positions and gradually overplay an opponent. They use their better chess understanding. Most players don't know what "a chess understanding" actually is. A chess understanding mainly implies your planning skills. If you understand a position, it means that you know what to do here. Thus it means that you can find the right plan. There are no educational materials about it. It is the hardest topic really. It is very difficult to systematize knowledge about a middlegame planning and to integrate it in a clear practical system. That's why 99% of authors even don't try to do it. How many chess books do you know, which offer an integrate system of a middlegame play? Ok, Nimczowitsch's My system is pertinent. Is there anything else? Well, there are a few other similar books, but anyway it is a very short list. Nimczowitsch did a great work certainly. However his system is not full and quite difficult for a practical usage (even Nimczowitsch had some problems with that). Also a lot of time has gone since that time. Modern chess has developed a lot. That's why I decided to create the course Your Winning Plan . It took a long time and a lot of effort to create such product. With pride I present you the final result. 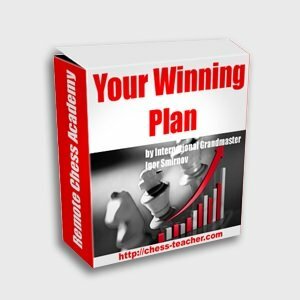 The course Your Winning Plan gives you an integrate system of a middlegame planning. Using this unique method you will be able to find the right plan in any position. This will give you a deep chess understanding and will make you not just a strong player, but an extremely strong one! Why different strategic books don't work in a practical game play. Important generalities about a chess strategy. Why planning is so important and what most players don't understand. What is the main difference between a strong player and a not so good one? What strong players use to beat others? What exactly is "a chess understanding" and how to develop it? How to predict a game continuation for many moves ahead? Lesson-1: "The Best Time for Planning". In chess books you have probably seen the recommendation "to compose a plan in critical positions". However they don't say how to detect those critical positions. That's why this trite rule is useless. I will be telling you how Grandmasters really think in a practical game. You will know the specific tips, which you will be able to apply right after a study of this lesson. When should you compose a plan? What should you do, when you don't know how to play? Typical mistakes of 95% of chess players. How to simplify your thinking process and to make it more effective at the same time. How Grandmasters find right moves so quickly? 4 type of situations when you should compose a plan. What is a guideline in a planning? Lesson-2: "How to Compose a Winning Plan". In this lesson I will tell you what exactly you should do and exactly how you should think to create the right plan. The universal scheme, which allows finding the best plan in ANY position. Which plan is the best in most positions? The most important strategic rules regarding to the planning. 3 types of situations when you should attack on a side. How to detect whether you should worry about an opponent's plan or not? Why the aggressive attacker players lose regularly? How to avoid their most typical mistake? How exactly the center bears influence on a planning? How to choose the right plan in any situation? When to move pawns and when to avoid pawn moves? How to make your plan really effective? The best way to exploit the opponent's weaknesses. When it is possible to use a passive defense and when you have to create a counterattack? What is wrong in Nimzowitsch's "My system"? The typical mistake in defense. The common delusion about a planning. When you should play vigorously and when you should not hurry up? The practical advice to make your opponent's life really hard! Lesson-8: "Two Universal Keys": In this lesson I will give you 2 universal keys, which are applicable for any position. They will help you not just to create a plan, but to create the most effective plan. Often it is enough to only use one of these keys to win a game without any problems. Also we will continue training the universal scheme of a plan composition. You will see how it is possible to systematize separate positional rules to remember and to use all of them easily in a practical game. This will help you to use your previous knowledge (from your past training) most effectively and to get practical effect from them. How Grandmasters always keep their pieces on the best squares? How to organize your thinking process to get the best effect? 3 stages of planning, which you should perform to win a game. I will show you in a real time mode how Grandmasters compose plans. You will see that it is not so hard actually (if you know the right way). How to figure out the best way for the realization of your plan? Lesson-10: "Grandmasters' Secrets of Planning". Previous lessons were aimed for making you a strong player. This lesson will help you to become an EXTREMELY strong player! This advice is your guide "how to be on the TOP". This is probably the most powerful part of the course. I have never shared these secrets with a huge public and I doubt if any other GM ever decide to do it. Why Grandmasters realize their plans more successfully than others? How Grandmasters deals with hard situations? Why Grandmasters win the games even after making mistakes? We will compare (in a real time mode) the usual way of thinking (character for most players) and THE BEST way. How to bend an opponent to your will? Which plans have more chances to be realized? Why players often fail in a realization of their plans? How to get a really deep understanding of a position? How it is possible to get the full control over the situation? This secret allows Grandmasters to get good results ALWAYS (while others suffer from instability). How you can solve the problem of a defense very easily. When experienced players offer a draw? What Grandmasters do to win an equal position? The recommendations for your further improvement. I strongly believe that knowledge that you can't apply practically is not just useless but actually harmful. Unfortunately this problem is typical for many chess books. In the course Your Winning Plan you will find only the practical recommendations. You will also know what and exactly how you should do to use these principles in your tournament games. The practical part of the course will help you to practice the course's ideas and to get approptiate practical skills. Thus you will improve your chess skills and will start winning more games right after a study of the course. 106 special tasks and games for your training. We will start from quite easy situations and then go to examples on the top Grandmasters' level! After that you will be able to find your winning plan in any position. The Grandmasters' thinking process (planning) in a real-time mode. So you will be able to copy the Grandmasters' thinking process and to get similar practical results!